The Multical 602 is an all-purpose energy calculator for heating and cooling, designed to be used together with flow sensors. The Multical 602 operates with a range of communication modules (recommended – Ultraflow 54) and has a high power radio router module. Integral data loggers constantly monitor a number of key functions in the meter, and report back any errors. The unit is also supplied with a data back up facility for safeguarding billing and consumption data for your customers. For heat, cooling and combined heat /cooling measurement in all water-based systems. Operates in temperatures from 2 °C to 180 °C for heat and 2 °C to 50 °C for cooling. Complete range of communication modules and integral RTC (Real Time Clock). Complete range of communication modules. Integrated troubleshooting, error correction and analysis of energy consumption. Constant monitoring of for errors. Saves consumption data on a yearly, monthly, daily and hourly basis, which provides the operations manager with a complete performance analysis. In case of power failure data is backed up, thus securing billing of consumption data. If the meter is supplied with battery, the battery lifetime has been considerably increased – up to 13 years incl. Wireless M-Bus. Precisely matched temperature sensors guarantee accurate measuring results even at minimal temperature differences. The flow sensor‘s long-term stability and accuracy are not influenced by flow velocity, flow disturbances or wear. 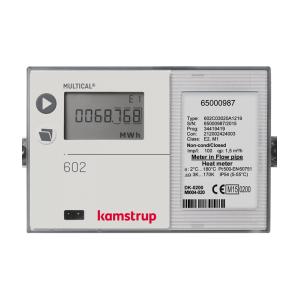 The Multical 602 is an all-purpose energy calculator which operates with a range of communication modules. Its integral data loggers constantly monitor a number of key functions in the meter and report back any errors.